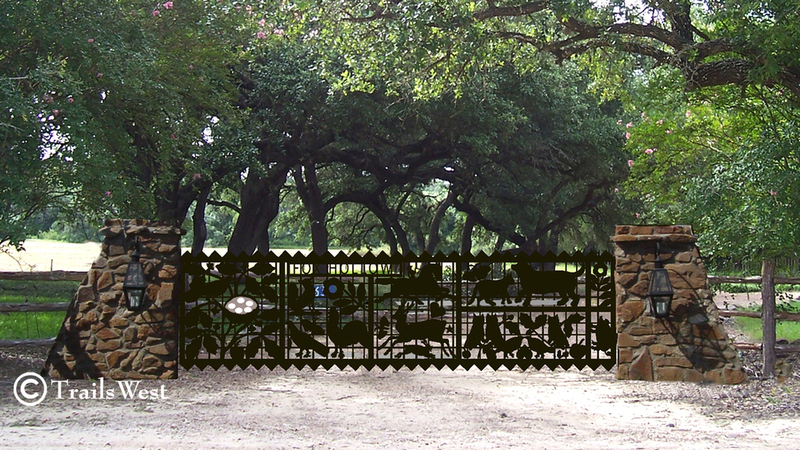 Custom platinum gates from TrailsWest Gates, custom gates, handmade in the great state of Texas. Gitten a custom gate from Trails West is like havein fried chicken ever Sunday at your mamas, you can count on it being real good and made with love just like your mama would make your gate-ifin she could draw and weld. Bienvenidos- This is such a beautiful and romantic gate when installed. We have made many versions of it and it continues to be a favorite. NCHA Futurity-this was the first gate we donated to the Youth Scholarship Fund. Tickets were sold and a raffle was drawn during the NCHA Cutting Horse Futurity in Fort Worth, Texas. His mother said her son Bunky would win it because he was such a lucky young man, and sure enough he did. 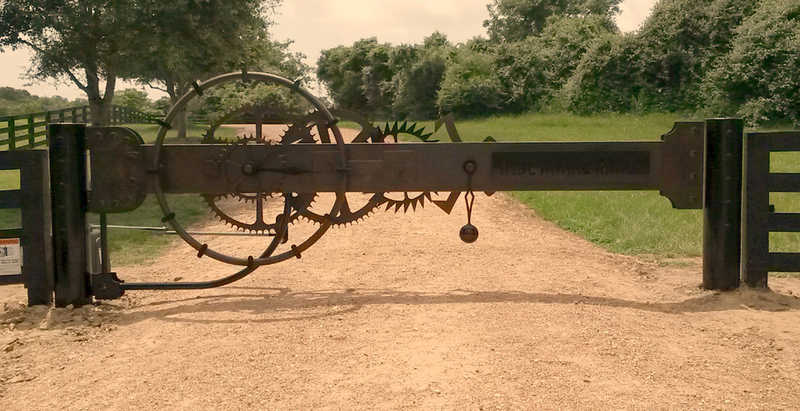 Pinelog Plantation Ranch - This entrance was designed and fabricated for a game reserve in Louisiana. He had a lot of exotic wildlife which we included in his art. Gate fits a 16' opening, side panels are also 16'. Two Coves Ranch - This gate is 5 x 18' x 6" wide. Yes, it is a behemoth. One side has all the wildlife the couple wanted and the other side has the water they enjoy. It is a very personal project for them. We made it so the middle could be rolled out for painting and LEDS changed out in 6-12 years. Thank you, Ben and Wendy. Strange- The inspiration for this art is the old hand tooled wallets that came in kits. I never made one but I love the classic western scrollwork. The owner wanted his two favorite horses on the gate, so the other side has a different horse. We also have LEDS behind the horses so they glow at night. NCHA 50th Anniversary - The NCHA celebrated 50 years as the National Cutting Horse Association, in honor of the event we designed and fabricated this gate to donate to the NCHA youth scholarship fund. Dalton Lake Home - I worked with a great architect on this, he gave me a lot of freedom. The client did not want any animals in the gate, I kept trying to sneak in a duck, but they killed off the duck. It is all water and woods just like his beautiful lake house. We also installed the rock walls. Milkmaid-This interesting gate is the gate for a family plot, in honor of their mother who was from Norway, and worked hard her whole life. Hilltop Ranch - The owner of this fine ranch came in and told me a story about his ranch. One morning he saw what he thought was some trash in the pasture and went over to take a closer look. The trash looked like it was moving....and sure enough it was. It was a baby donkey, he looked around and said who did this? He had no idea any of his donkeys were in foal. Folk Art Quilt - Trailswest built these great columns out of native stone, and hung the sweetest folk art quilt gate on them. The quilt even has little eggs in a nest-painted like a robins egg. The home is a traditional salt box. Jack Russell Territory - These clients race Jack Russell Terriers, anyone who knows these dogs know how high energy they are and how infuriating they are about digging. So of course we had to make one digging. Falconwood - It is a cold and misty morning, butlers are serving hot chocolate on silver trays. The hunt is about to begin. You are still shivering in spite of your long underwear, you will get warm as you take off, it is not about comfort-it is after all-the thrill of the chase. El Pez Vela-This is for a special client, we have worked together on many gates and several have been coast related, we even made 9 in stainless steel. Custom gates are truly custom. You can have anything you want. Just give us a hollar and tell us about yourself. We will make it truly unique, and the envy of all your sidekicks.